This No Slip Yoga Towel by Gaiam is an absorbent microfiber yoga towel you can place over your yoga mat to absorb sweat during hot yoga sessions. Or, flip it over for a slightly sticky surface that adds instant grip for more challenging poses. I really like this towel. The completely rubberized side prevents it from slipping even when completely dry. The only drawback is that it doesn't dry very quickly. Hanging it for a couple of hours is pretty much your only option. 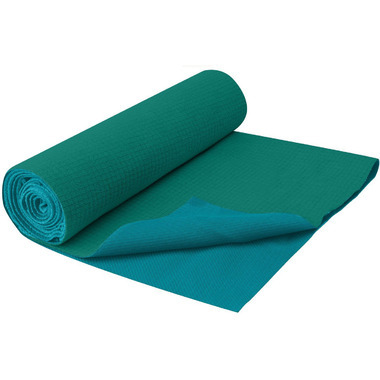 This is the perfect mat towel for all yoga classes. I highly recommend this product.